Born in 1972 in Moscow, USSR. 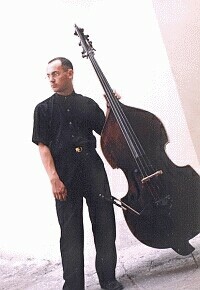 A virtuoso bass player, graduated from Moscow State Tchaikovsky Conservatory in 1995 as a soloist; has also studied composition at the Conservatory. 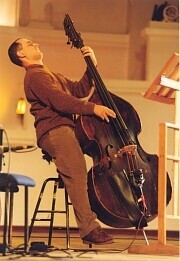 In 2002 was awarded the prestigious title of “The Honored Artist of Russia”, thus becoming the youngest bass player ever in the history of both Russia and USSR to receive this award. From 1992 to 2004 has been working as the Principal Bassist with one of the most famed russian chamber orchestras – “Moscow Soloists”, conducted by Yuri Bashmet. Mr. Goloubev has performed with many great masters, such as Gidon Kremer, James Galway, Mario Brunello, Sarah Chang, Lynn Harrell, Barbara Hendricks, Sviatoslav Richter, Mstislav Rostropovich, Thomas Quasthoff, Vladimir Spivakov, Maxim Vengerov, Uto Ughi – to name a few. Alongside with his classical career, he has for a number of years been pursuing a career of a jazz player, playing with Paul Bollenback, Eddie Gomez, Miles Griffith, Shawnn Monteiro, Adam Nussbaum, Denise Perrier, Christoph Spendel, Glauco Venier, and many others. During the last 15 years, the tours have taken Yuri Goloubev to over 40 countries and nearly all world’s most important venues – Carnegie Hall (New York), Suntory Hall (Tokyo), Concertgebouw (Amsterdam), Musikverein (Vienna), Salle Pleyel (Paris), Royal Albert Hall (London), Palacio de Bellas Artes (Mexico), Sydney Opera House (Sydney), Palace des Beaux Arts (Bruxelles), Academia Santa Cecilia (Rome), Megaro Hall (Athens), Gewandhaus (Leipzig).... full list would take several pages. Obviously, a great number of festivals have welcomed Mr. Goloubev - Bath Music Festival (England), Hommagio a Roma (Italy), Casals Festival (Puerto Rico), Festival of Perth (Australia), Prestige de la Musique (France), Kuhmo Chamber Music Festival (Finland), Hong Kong Festival of the Arts (Hong Kong), Boheme Jazz (Russia), Istanbul International Festival (Turkey), St.Petersburg Jazz Spring (Russia), Eilat Festival (Israel), New Zealand Festival of the Arts (New Zealand) are amongst them. Moreover, in 2000 the well-known magazine “Harper’s Bazaar” placed a feature article on Yuri Goloubev. Mr. Goloubev has also written a certain amount of chamber and jazz compositions, as well as bass transcribtions, some of which have been published in Russia, Germany and the USA. Apart from his performing career, Mr. Goloubev has been conducting diverse master-classes in the USA, England and Ireland. Goloubev’s art has been featured on nearly 20 CDs, including 3 CDs as a leader and composer (“Rendering”, 1996, “Toremar Island”, 2001, “The Birdge”, 2003). From December 2004 lives in Milano, Italy, where performs jazz with Enrico Pieranunzi, Giovanni Falzone, Claudio Fasoli, Antonio Zambrini, Rossano Sportiello, Glauco Venier, Massimo Manzi and other leading italian musicians.